This well established wine bar/restaurant, just a short walk from the centre of Woking, is a very popular destination for both locals and the business community for either a relaxed drink at the bar or to enjoy a snack or full meal at lunch and dinner. 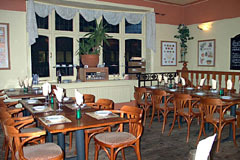 The affordable menu is complemented with a daily specials blackboard. Owner Enzo’s outgoing personality and natural charm ensure that guests quickly become friends, knowing they are assured of the warmest of welcomes, great food and a range of drinks and wines for all occasions. Bar open Mon-Sat 10am-11pm, food served Mon-Sat noon-2.30pm and 6-10pm. All major credit cards accepted (not Diners). No service charge except for parties of 8 or more (10%). A selection of snacks, a la carte menu and daily specials blackboard. A fantastic evening. Good food, wine and great value . Recommended .